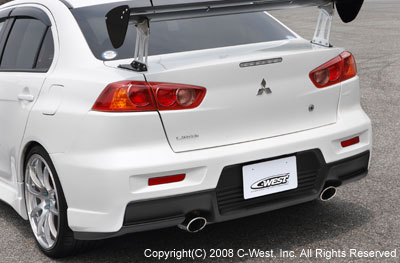 C-West rear bumper adds style and improves downforce. Rear Bumper is made from PFRP. Pliable Fiber Reinforced Plastic (PFRP): This material has similar properties to those of FRP, but is a lot more flexible. The rear bumper made with PFRP is much more difficult to crack due to its flexibility and is much more pliable when installing. Depending upon the paint, PFRP aero-parts are much easier to repair, even with damage received while the vehicle is in motion.